It took me some time until I could fully recover from the ordeal of this race but finally I an now able to move my limbs again and write some lines about the event we had last weekend. Of course I was delayed in the office and couldn't leave on time. And once I was home my son showed me a note from his teacher who was less than pleased with his recent performance which required additional time. And of course I forgot to print out all necessary infos for the race and pack my gear probably. And then I als went to Nagai-Sans shop to show him the new POSITIVO ESPRESSO shirts which have just arrived in time. So when I finally rode along the Tamagawa in direction Hachioji it was already 19.15hr. This was the first time for me to ride during the night along the river, there were still a lot of people and even more people with dogs on the road. And one had to go slow and remember where the potholes and other obstacles are. But it was definitely interesting. The opposite side (Kawasaki etc.) of the Tamagawa is not fully civilized yet - there are parts without light and I never noticed this during the daytime. An almost surreal experience. I finally arrived in Hachioji and immediately found the Rhythm & Blues (R&B) Hotel. I avoided any discussion with the clerk and took my bike as it was to my room. As the room was barely bigger than my bike, I had some difficulties to enter. Yes, the R&B Hotel belongs to the Washington Hotel group which is famous for their small rooms. They own more than 10.000 hotel rooms all over Japan, however all together their size is only slightly bigger than the typical expatriate living room in Denenchofu. This is a business hotel and business hotel means that the hotel is doing brisk business, whereas the customers are doing not - otherwise they wouldn't stay there. I cannot understand why they have smoking rooms. I mean it is anyway forbidden to smoke in the bed - but where else can you sit, if not on the edge of the bed. But it was cheap and David made some efforts to organize the accommodation so I shouldn't complain. 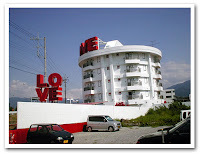 But the next time, if there is a next time, I am going to stay in the Vanilla something love hotel on the opposite side of the Takao-guchi station. I am ready to share a double bed with whomsoever. 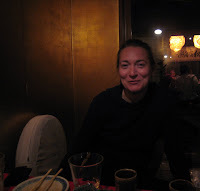 We had a very nice dinner in the gold room of a very nice restaurant in Hachioji. We would have stayed longer, but all of us were nervous and wanted to go to bed early. Unfortunately what looked like a bed in the first instance, turned out to be a massive steel mattress with a brick-like cushion on top. Everything in this bed was as soft as Stalin and I could barely sleep. But perhaps I should stop here writing about the hotel and focus more on the race. Which actually started the next day. So basically we left poorly prepared in the morning, but we had our team jerseys on and we really looked like a team. Juliane and david had forgotten their invitation postcards, only Tom and David had a description of the roads with them. Later it turned out that Juliane was supposed to start at 6:00 AM and not at 6:30 AM as all other Positivi riders. We had however plenty of food from a bakery raid the night before. When filled with stuff, the orange bag pockets look like a life jacket. So we looked like a group of non-swimmers on the way to the pool. We made our way to the start area quickly, Tom was already there since April 19th or so. Then we started. We were in the last starting group departing at 06.30hr, about 20 riders I would guess. Among them Greg, a guy I did not remember when I saw him, but when I saw his BMC bike I remembered that I talked to him in 2007 at the 7-Eleven at the Honjuku - Kazahari approach. So we started and rode already at a brisk speed. When I later checked my CICLO data, I found out that it took us only 16 minutes up to the Otarumi Pass - so already a pretty fast attack time. This would have guaranteed an entry in the TOGE BAKA list on this website. Nevertheless a lot of the Japanese riders rode away already on the ascent. David provided a lot of draft for the peloton and Tom in particular. I guess Tom could spend about 2 of the total 294 km of the race in the draft of his fellow Positivo Espresso team members and I am sure that this laid the foundation for his excellent result. On the top of Otarumi I felt already like puking and seriously considered to give up. The weather didn't look good. There was some strange pain in my left ankle. Anyway I continued and began to feel better. Even the ride through Uenohara on route 20 was without any incidents. This city I despise so much. Also the weather became better. We had a fight with a big dumper truck who was constantly blowing his horn. By the way, if you want to file a complain, his number plate was 八王子１００は9-16. Still remember this one. So we reached the first checkpoint after the modest ascent to Sasago tunnel after 57 km and 2:07 hrs with an average speed (all inclusive) of 27.0 km/hr. I have no idea why we stopped at the checkpoint. There was really nothing, in particular no food, except for some chocolates. 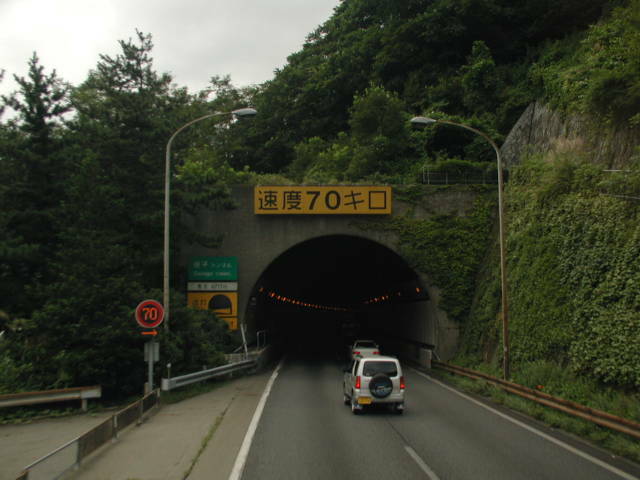 And so we made a photo and vanished into the Sasago tunnel. We had heard a lot of bad things about Sasago Tunnel, the new one. In contrast to the new tunnel, the haunted old one on top of the mountain looked like a bikers paradise. So we carefully vanished into the black hole. But the traffic was light and the tunnel well lit and not as long as we thought iｔ woube be. In particular when compared to what was waiting for us between Hakuba and Itoigawa later on. "He gave me NO LOAN to play MORE AND MORE PACHINKO at KOKUSAI"
was the best I could came up with. And Kofu also has the CLUB RUDE. This is a very famous hiphop club and it seems that they have even a video on You Tube. Actually people line up for this club in long lines which reach until CLUB WOMB in Shibuya. 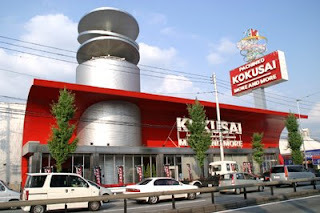 And then Kofu has all this wonderful steel girder structures which used to look like abandoned gas stations and reminded me of this famous quote of William Gibson, "of a future that never became one" when he commented on the SF designs of American gas stations in the fifties. But in fact these structures are used to cultivate grapes which in turn are made to wine ??? from Japan ???? Sorry, I was distracted from the race again. Otherwise Kofu was ugly and the traffic was messy. We were forced to ignore some red lights and as a result we pretty soon overtook some other riders. Then we arrived at the second Check Point after 49 more km and at an average speed of 30 km/hr (for the second stretch only, all inclusive). At least there was something to eat there and david used the occasion to rearrange the mess in his bib shorts. After this checkpoint the long climb to Fujimigaoka or so started. 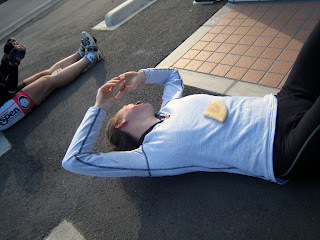 We stayed pretty much together as a group on the approach; however I was afraid that I would run out of carbs and bonk; Juliane was so kind to give me some of her maple syrup soaked pastry. There must have been something wonderful inside - my hands were almost glued to my handle bars and I started to pedal constantly up the slope. In fact my hands WERE glued to the handle bar due to the adhesive superpower of the maple syrup. It took me considerable time to clean up the mess the next Sunday. So I was on top at elevation 950 very fast and overtook a lot of riders, among them a girl from the ASPEN team and a guy in a blue ASSOS jersey (hello David Marx!). I felt a little bit bad about leaving my team mates alone on the ascent and anyway I needed something to eat. So I stopped at the next Lawson bought some food and a big bottle of water which I intended to distribute to all of my team mates. When they came down from the top, I waved with the water bottle and signalled in sign language "Hey guys, I bought some water for 210 Yen to make up for all my previous sins. Stop and refill your water bottles." But they were not very much interested and I could barely motivate them to stop for me. On the other hand, we made a stop at a convenience store only 11 km later and before the next checkpoint. Before we arrived there we overtook the Aspen girl and the Assos guy. And after the stop we overtook them again. Then we finally arrived at the next checkpoint after another climb which brought us to elevation 1.020m . 64km distance in 21.8 km/hr average speed. The average dropped a lot because we had one long break and we need to do a lot of climbing. At this point we have already climbed almost 2.000 meter up. The view of small red LED lights attached to cycles in tunnels in front of me. 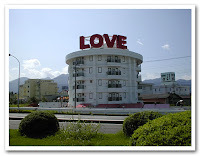 So Matsumoto is unfortunately like any other town in Japan. Long roads from the center fanning out with pachinko parlours, car dealers and other facilities I do not frequently visited. Boring. I thought about when I travelled the first time to Shikoku and arrived at a construction site in Tokushima where one of my previous company elevator was being installed. So how to roads in Shikoku, this backyard of Japan look like? 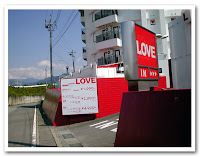 Just like in Tokyo, Saitama and Matsumoto is the answer. Pachinko parlours. Car dealers. Yamada Denki. You know it - you name it. But we also had here one of our best performance as a team, everyone was willing to share a portion of the drafting work in the front and we frequently rotated. We also frequently lost our way. That led to the interesting fact that we overtook at least three more times the Aspen girl and the Assos guy (from now on, shortcuted to Assos GAG). Then the ascent to the Hakuba valley started. We were all looking forward to the next checkpoint and some fresh food which was supposed to be at km 225 or so, just outside the town of Omachi. So we passed happily through Omachi, ignored all 7-Eleven and Lawsons on the way and were anticipating a nice break. Then someone of us asked one of the Japanese riders who was with us for quite some stretch and who attended the race for the 12th time, how far it would be to the next checkpoint. And to our dismay we found out , that the Omachi checkpoint had been reallocated for some unknown reasons some 22 km further down the road to Hakuba station. 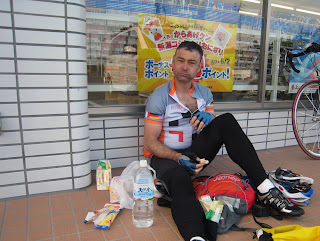 We were pretty desperate for food at this point and afraid that as we have almost crossed Omachi completely, we would not find any convenience store on the open land between Omachi and Hakuba. Of course in Japan these fears are irrational. In average there are more conbis on Japanese roads than cars. Sometimes they are even piling up on the left and the right side of the road, trying to overtake each other and blowing there horns. OK, I am exaggerating. But some of them have flags with slogans like "ODEN TO THE PEOPLE" (see below) - which is equally stupid. Of course we found a nice LAWSON on the outskirts of Omachi. When I was young, I used to complain about McDonalds and similar establishments where you can find the same food all over the world - how boring. I wanted to mix with the locals, have local food and I hated to become recognized as a German tourist. In fact one time in South Italy, I felt confident enough to state that I am from Liverpool, as anyway nobody would speak English there. It was only unfortunate that this was just a few weeks after the Heysel stadium tragedy where many Italian soccer supporter were killed when they were attacked by (liverpolian) hooligans. The Italian knew that, I didn't and the atmosphere became rather frosty - perhaps I would have fared better if he would have said that I am from the East German Stasi. Anyway, I am so happy that in Japan I can go to any Lawson or 7-Eleven just everywhere in the country and buy Weider Energy Gel, a raisin bread, shoecream pastry and I do not have to rely on local specialities such as jelly fish ingestines. Sorry, I became distracted again. But this is how one's thoughts are going when one is riding long stretches on a bike. So we took a long and nice break in front of the Lawson. We all looked pretty deranged. Juliane and david in particular looked like Amy Whinehouse and Pete Doherty after a big party night. We then started the last stretch to Hakuba. 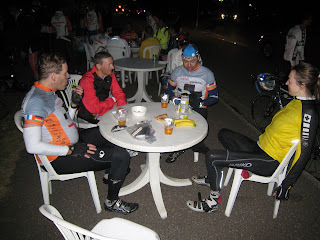 David and me were riding alone in front and we arrived first at the Hakuba checkpoint. As usual we overtook Assos GAG. We had discussed previously that we would make only a short break there as it was slowly getting dark. And cold. But then it took much more time. Again, we were getting slower, for the last 79 km since the 3. checkpoint we had an average speed of 21.6 km/hr only, mainly due to the long break at Lawson. I was afraid that we would not make it before dark and also not within 13 hours. 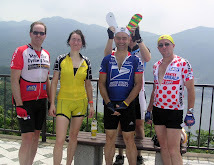 David asked a more experienced rider at the Hakuba CP how many climbs would be still in front of us. He answered that there would be only one - but one should never ever believe such statements. Indeed there were no long climbs waiting for us but several small ones. And we entered the land of the long tunnels almost immediately. Tunnel after tunnel, it became really scary. Of course we overtook Assos GAG again. So we were moving at a very fast pace, first in order to catch all the red LED lights that were riding in front of us in the tunnels and second and most important, because we were terribly afraid to get killed by one of the big trucks that were overtaking us in the tunnels. The pure terror and fear of getting overrun was giving as incredible superpowers. I was really, really afraid. At one point I was trailing about 30 m behind my teammates when a long car transporter truck overtook me with minimum clearence and I was first moved towards the tunnel walls and then I swung back into his line and the truck was so long that I could barely keep a paralell line to him. Also I forgot to stuff away my racing sunglasses and wore my normal glasses. It was very dark in the tunnel already and sunglasses do not help to get a better vision and more confidence. So once we were out of one tunnel I asked my team mates to stop, so that I could exchange my glases and all of them gracefully complied. 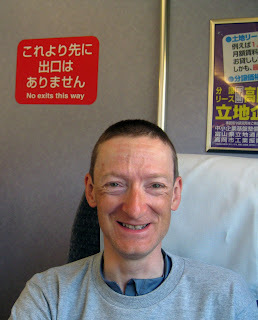 We then had a very fast run towards Itoigawa, two other riders tried to jump on our back. I guess at the last stretch of 45 km we overtook more riders than we did the previous 250 km. 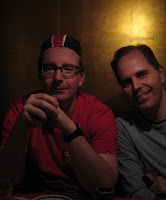 Ok, if we count them single, because in the meanwhile I personally had overtaken Assos GAG about 56 times. Anyway, the last stretch then saved the day. We were running fast at 37.7 km/hr average and I still felt that I had some reserves. And then suddenly it was over, we arrived at the goal after 12 hours and 27 minutes - so very close to our time goal of 12 hours. Tom was already waiting for us for a long time. He had grown a long beard and was accompagnied by a guy he used to call "Friday". Perhaps we were not so happy that he already speeded off at the approach to Otarumi, but in the end he officially finished in 6th place within less than 10 hours. The best rider, actually a foreigner, finished in 8:34 hr. 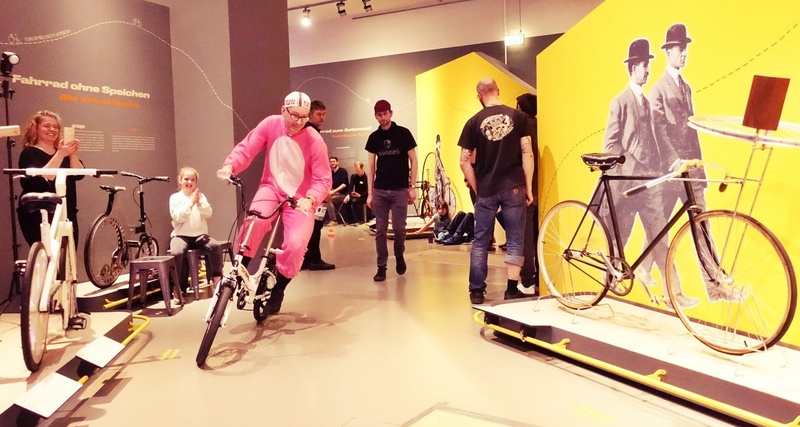 Even more interesting is the fact that he (the winner) was off the bike only for 20 minutes all together. Now look at our team : 12:27 total, off the bike:1:51, on the bike : 10:36. So if we skip all breaks next time (we need a support car !) and do a little bit more training and effort we can keep up with Tom. On the bike we had a speed average of 27.9 km/hr, which is not bad at all for this distance (plus traffic conditions). We finished all around place 130. Juliane became unofficially the 5th fast women. If she had only started at 6 AM. 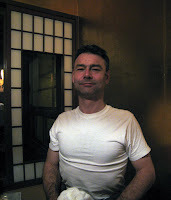 Ok, so after a beer we retired to our minshuku hotel in front of Itoigawa Station. 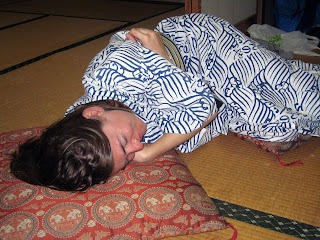 We were really tired and drank some sake in the onsen pool before we had some o-bento and assembled for a last round of alcohol in our room. 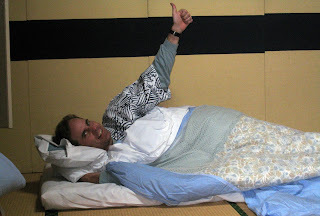 The people from the minshuku were very nice and gave us a big room. I was not as tired as I was after the Sado Long Ride race last year - only 210 km but all the time in the cold rain. But I was tired and I was also proud that all of us made it in the end. The sad part about all this is that just now, when we have equally strong team members, a good intiutive understanding between all of us, yes, even team jerseys and an idea how to rotate, that this will most likely be the last season that we will ride together. We had a lot of fun and we got used to this and while some of us will move on to more exciting parts of the world and interact in new adventures, some of us will continue to stay in Tokyo and have to find new riding mates. Anyway, it is as it is and I should not amy whine about. I rode home the next day with David and Tom. On the train - in order to avoid any misunderstandings. I got a haircut finally. This is another funny story which I will tell another time. I made a photo of Tom on the way home in the train which very well displays how we felt after the race: marked by desitution and happy that this one in over. And somewhat proud of oursleves and the silly achivements we made with no real purpose whatsoever: "NO EXITS THIS WAY" A good slogan we should add to our jerseys. And today my behind has finally recovered so that I jumped on the bike again and commuted to work. The 1:05 hr for the 31 km stretch was probably the fastest I ever did, 68 km/hr down the country club road was also not bad. So I should be in good shape for the Tokyo Oifuto race on Sunday. Hope it will not rain. And on Thursday I went up to Kazahari, achieving a respectable time. But I felt sooo tired afterwards. I really rode to much this week, I counted all in all 600 kms in 7 days. I also felt strong during the race. 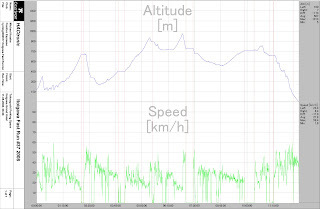 It finally pays off that I was riding through the winter and that I changed my riding style with less emphasis on power and more on cadence. Last year it was a personal defeat for me to change into inner on a ascent. Now I can pedal faster and more constant up the slopes. In the end I would like to thank all of my team members for this perfect event. Tom did a lot of footwork to get all of us organized; he and David convinced the rest to attend this race. david was the most photogenic guy on this tour as can be seen in the photos. Juliane, a friend now for 10 almost 10 years is a real friend. Thank You. Example of Oden to the People! We are the Oden fan club! Not just your writing style but some of the pictures are simply hilarious! A literary tour de force! I added the race profile today and edited the post a little bit. Please enjoy. Thanks for the comment anonymous Marek I suppose.